One question you might be asking yourself upon reading this recipe title…Is tomato-free a trendy, new special diet? Not exactly. But for some, life without tomatoes is part of a nightshade-free diet necessitated by various reactions or health conditions. And what the heck is a nightshade? That’s the same question I asked before I prepared a variation on quinoa-stuffed acorn squash for a friend whose doctor temporarily cut her off from tomatoes, eggplant, potatoes, bell peppers, and many other cooking staples I take for granted. Luckily the restriction was non-life-threatening, because I completely spaced on the ingredients in store-bought veg stock. No worries, though–there were plenty of addictive vegan chocolate cake balls for dessert to make up for my oversight. It’s not like people are searching for nightshade free recipes with anywhere near enough frequency to rival the popularity of gluten-free, paleo, or vegetarian recipes, so why make this “pie” tomato free? Mainly because it’s part of a series in which I’m cooking my way through the Gratins chapter of The New Vegetarian Cooking for Everyone, and the original recipe doesn’t call for tomatoes. I was a little surprised, given the success of tomatoes in the filling of polenta pie gratin, but hey, I didn’t write the book. And it turns out, tomatoes are totally unnecessary here. 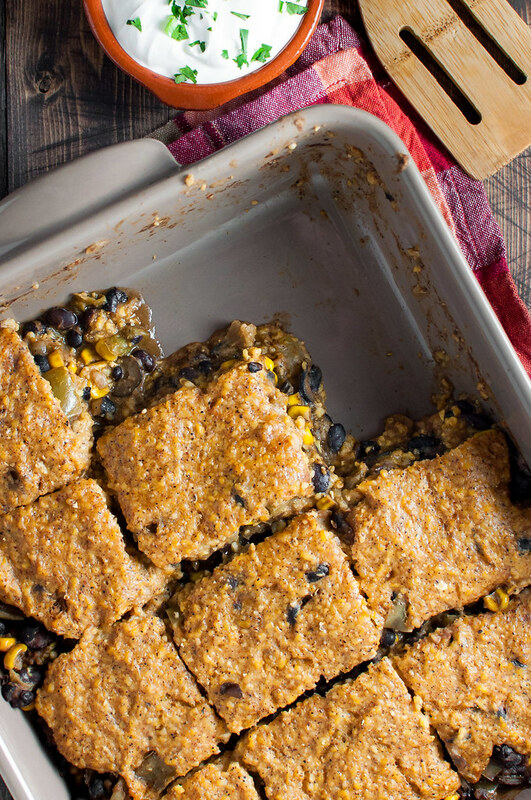 Their absence contributes to a more mellow, but still thick, black bean filling. Starch from the beans, which I mashed slightly as they cooked, permeates and thickens the “stew” filling. 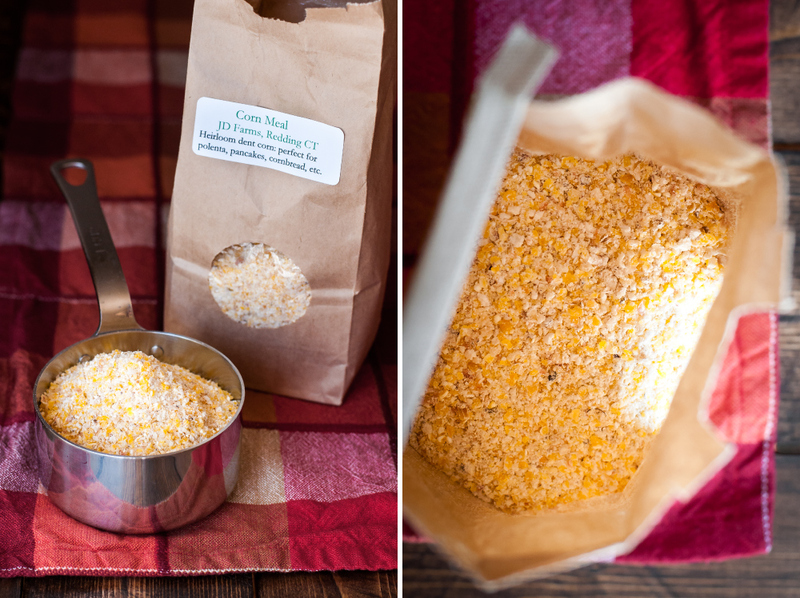 When I took an early-season tour of my summer CSA farm, The Hickories, a few weeks back, I picked up some local stone-ground cornmeal (featured in this gift basket, but I can’t find it for sale online anywhere else). What a treat. I swear it made a noticeable difference in the cakey “tamale” layers of the pie. 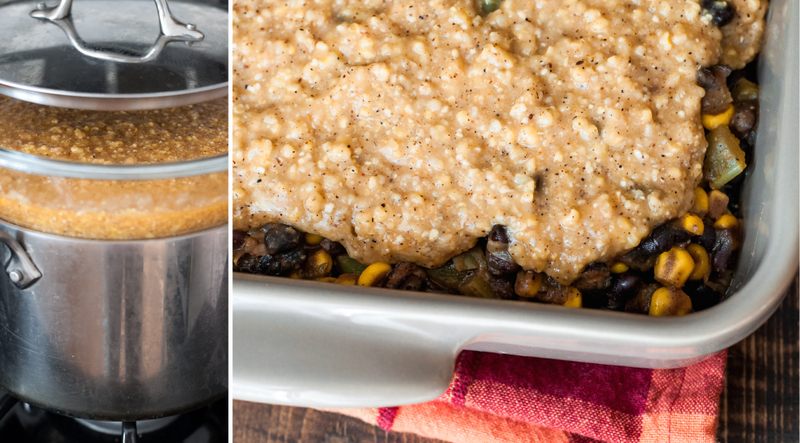 If you can find something similar from a local farm, farmer’s market, or well-stocked grocer, it will make all the difference in this tamale pie, in which the cornmeal plays the leading role. It was so good, I’m not even mad that I’m still nursing a painful little burn between my thumb and pointer finger on my good hand from a burst bubble of the thick, simmering “cornmeal mush”. I’m constantly struggling to keep up with posting these days, but I’m giving it my best, dangit. Nonetheless, I’m a week behind on gratin posts, so I’ve already made a turnip and leek gratin in blue cheese bechamel that I’m pretty pumped to share. Like, whose idea was it to throw blue cheese into a warm, creamy bechamel??? Oh, that’s right, it was mine. I swear I’ll tell you all about it soon, but for now, suffice it to say it makes the grade as one of my top five favorite gratins. Little opportunities are finally starting to poke up in the other sphere of my business. I delivered a super-healthy lunch for 25 last week and just heard from my client that the teachers eating it could not get enough of my guacamole! “It was like crack.” The ultimate compliment. I also packed up a small order of gluten-free, oat-flour-based double chocolate cookies ordered by my awesome Friday yoga instructor (not to mention whipping up a separate batch of them for Dad to take home). For Mother’s Day, I tested then churned out about 100 mini blueberry oat bran muffins (I’ll share my adaptation of Ina’s recipe in another post), tied them all up with a bow and a recipe card, and delivered them to church as part of the kids’ special package for their moms. Things got a little crazy and sleep-deprived, but I had a blast. Slow-cooked, subtly spiced cornmeal. 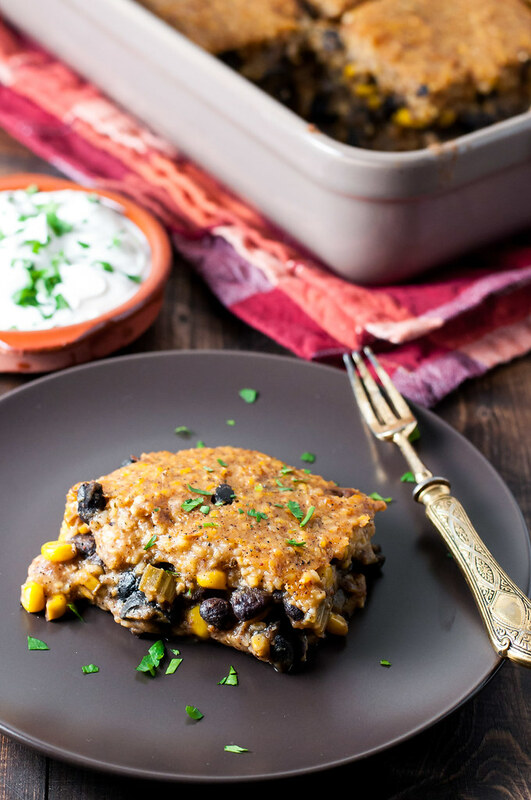 Simple black bean stew filling. 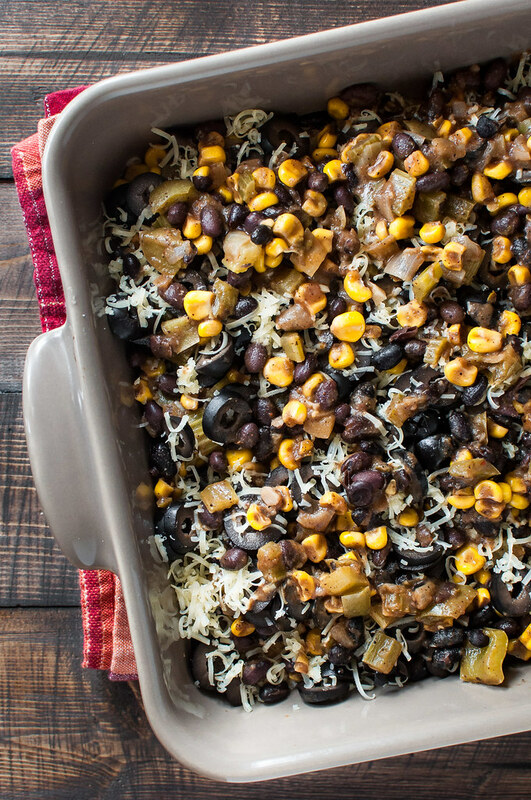 Who says comfort food can't be healthy? Bring water or stock to a boil in a medium saucepan, then whisk in the cornmeal. Cook 10 to 15 minutes, maintaining a vigorous simmer. Stir almost constantly. When thickened to the point that it's slightly difficult to stir, transfer mixture to a heat-proof glass or metal bowl that fits securely over the same saucepan. Add oil, salt, and chile powder and mix to combine. Rinse the saucepan (it needn't be spotless), fill with water so that the bowl, when set over the pan, sits just above the water. Bring water to a simmer, set bowl of cornmeal over it, and cover. The cornmeal will continue to cook without need for attention as you prepare the filling, 45 minutes to an hour. Stir once or twice during that time. To make filling, heat oil in a Dutch oven over medium. When shimmering, add onion, bell pepper, and celery, and cook about 5 minutes, until onion starts to brown. Meanwhile, add enough water to the bean liquid to total 1½ cups and set aside. Add garlic, oregano, cumin, and chile power to onion mixture and cook about 1 minute, stirring constantly, until fragrant. Add corn, beans, reserved liquid mixture, and salt. Bring to a simmer, raising heat if necessary. Cook 30 to 40 minutes, occasionally stirring and using a potato masher or the back of a wooden spoon to break up some of the beans. Once bean stew is done (it should be reduced but still pourable), remove from heat and season with more salt as needed. Preheat oven to 375 (F). Spread half the finished cornmeal in a 9 x 13", or slightly smaller (see notes), pan or baking dish. Let cool 5 to 10 minutes until slightly solidified. 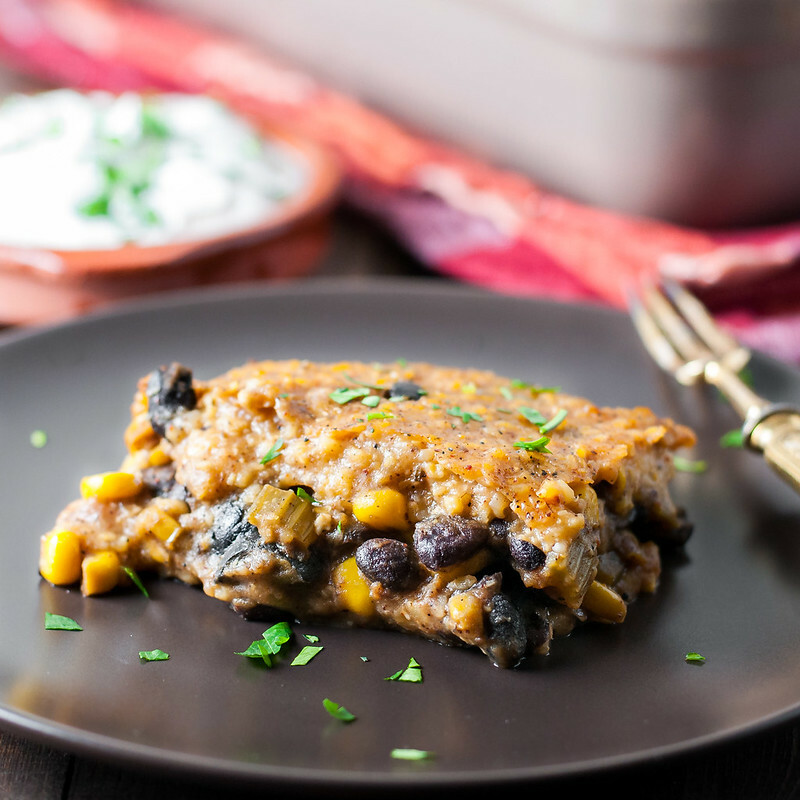 Spread half the bean filling over the first tamale layer, sprinkle with all the olives and ½ cup cheese, then cover with remaining filling. Stir remaining cheese into cornmeal mixture, then spoon it over the filling and spread gently with the back of a spoon to form an even layer. Bake for about an hour until bubbling. Cool for 5 to 10 minutes, then serve topped with sour cream or other desired fixings. As written, the recipe is gluten-free and meatless/vegetarian. For optimal flavor and color, use a mixture of water and vegetable stock to cook the cornmeal. Using all vegetable stock will taste great, but the color of the finished product will be on the brown side. I used a 9 by 13" pan, and you can see in the pictures that the cornmeal layers are thin and don't quite reach the edges on the top layer. For thicker tamale layers that completely cover the filling, use a slightly smaller pan--just be sure it's deep enough! The assembled pie can be refrigerated up to a day in advance. Remove from refrigerator 1 hour before baking as directed. Note: This page contains affiliate links. It does NOT contain sponsored content. Affiliate links (to products I recommend, on Amazon) offset my ingredient and website maintenance costs, so I can keep bringing you nightshade-free recipes like this one. Thanks! This looks DELICIOUS! I love how comfort-foody it looks, but how healthy it is. The tamale layer looks divine, as does the filling. Pinned! This looks and sounds great. Can’t wait to try as newly eliminating night shades. Bell peppers and chile powder are nightshades, so if like me you have a nightshade intolerance, omit them. If you’re cooking for someone who is, please knot that nightshades include not just tomatoes but all the peppers–except black pepper– which means paprika, cayenne, chile, tomatillo. Plus potato and eggplant. The recipe looks delicious otherwise.